Raith Rovers defender Kyle Benedictus is determined to bounce back from the disappointment of last season after signing a new one-year contract with the club. The 26-year-old suffered a double setback last term with a fractured fibula, which kept him out of action for five months, followed by the pain of missing out on promotion. However, the former Dundee defender is hoping to put all that behind him and hit the ground running for what will be his fourth campaign at Stark’s Park. “I’m delighted I’m back,” he told the Press. “When the manager spoke to me at the end of the season and said he wanted to keep me on, it was a no-brainer for me. “As a club, and as players, we’re due the fans a promotion next year, and hopefully we’ll do that. “The way last season finished was disappointing, but full credit to Ayr, it was neck and neck the whole way and they pipped us on the line. “The play-offs were a disappointment and maybe after the heartbreak of the last day of the season boys’ confidence just wasn’t up to scratch. “But it’s all about looking ahead and focusing on next season now because it’s a big year for everyone who is going to be here. Whether Benedictus retains the captaincy remains to be seen, but regardless, he intends to play a leading role at the club next season. “I’ve not spoken to the manager about the captaincy yet, but whatever he decides, I’ll be a team player from day one and I’ll be fighting for that jersey as much as anybody in the team,” he added. The months spent on the sidelines recovering from a broken leg, and then trying to get back to his best on his return to the pitch, were tough times for Benedictus. “I’ve never had an injury as bad as that,” he said. “From thinking I was going to be out for a couple of months, it turned out to be five months going on six. “I got myself back and, realistically, I wasn’t the player I had been in previous years. “I felt fit in training, but games and match sharpness are totally different. “I’m hoping to get a good preseason under my belt and then I’ll be raring to go again, and hopefully be the player I was before. 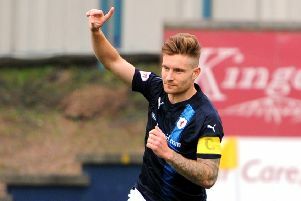 Benedictus already owns a league winners medal from his spell at Dens Park, but the defender is desperate to add another to his collection with Raith. “That’s why I’ve took this deal again,” he said. “It’s another chance to win something, and not a lot of people get the chance to do that in their career. “I won a championship at Dundee before, but you don’t get sick of winning things. The installation of a top-of-the-range artificial surface is well under way at Stark’s Park, and Benedictus added: “Some boys fancy astro, some don’t.